Not Too Little for Chores Baby! Clothing yanked from drawers and tossed any and everywhere by a giddy little toddler. Food mashed and tossed onto the floor when she decides she’s full or just doesn’t like the menu. She takes pleasure in balling up, ripping or drawing on any and all papers she comes across. Sometimes I think Quinn believes it is her job to add to the list of chores her daddy and I have to do to keep our home orderly and clean. When we straighten up, my little girl laughs hysterically as she pulls the pillows off of the sofa that we just neatly placed. Though it can be a challenge at times, her laughter still puts a smile on my face. Interestingly, a few months ago while I was sweeping, Quinn showed an interest and kept wanting to grab the broom or dust pan. She actually wanted to sweep! 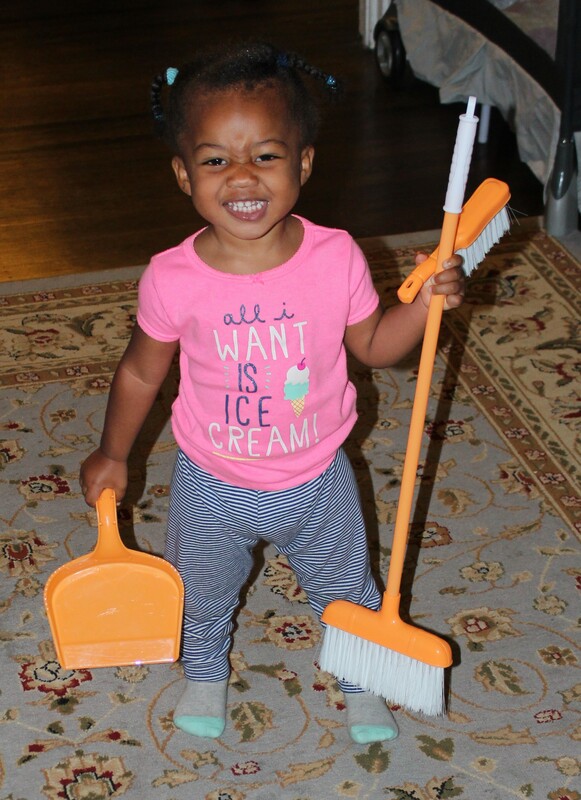 At that moment, I wondered, “Is she too young to have a basic chore or two?” For fun, I did purchase my little 17 month old her very own broom and dust pan (actually when she was 15 months). Though she still prefers to use mine, she will eagerly grab her broom to “help” me sweep the floor. Presently, putting away her toys or helping me put away her clothes after she has decided to toss them out of the drawers with wild laughter or closing the door after I have loaded the laundry are some of her chores. I want to not only teach Quinn how to be responsible, but I want her to not dread chores but look at them as a way to bring us closer together as a family. What chores do you have your little toddler doing? Is 17 months too young? I’ve always enjoyed reading as a child and remember being so excited to select books at the library, local book store or just off of my personal bookshelf at home. It is my hope that my daughter will have the same level of excitement and have a strong affinity for reading. While my daughter was still growing inside of me, I would read to her and feel her kick every so often as though she was delighted with the story and wanted me to read more. Since she was born, my husband and I to read to her least three or more times a day. What truly amazes me is for the past few months when my little girl Quinn wakes up, she immediately looks for one of her books as though it is the morning paper and casually yet intently leafs through the pages for about ten to fifteen minutes, sometimes even longer. We all think our children are geniuses or special, and Quinn is no exception. For some reason, Quinn has always known which way to hold a book. No matter how many times my husband and I intentionally giver her a book upside down, she will turn it right side up before she starts “reading.” Occasionally, she will read aloud in her special language eagerly pointing to the pictures and identifying the objects she sees when asked. I just love that my inquisitive little girl is so interested in books and will do all that I can to increase her fondness of them.